"For Friday, I have room for the Macarons or the Kouglof and Brioches classes", the lady had said on the phone in her fluted Parisian accent. I don't care much for brioche but I sure love macarons and kouglofs. 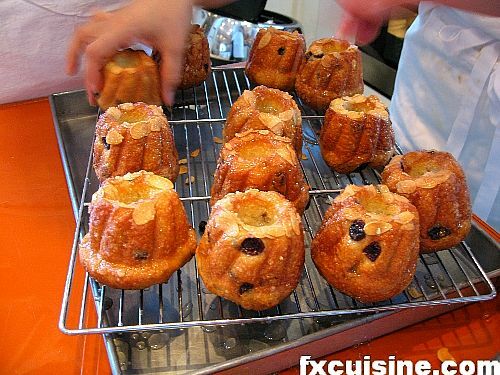 Lenotre offers Macarons classes three times a week, so I booked Brioche and Kouglof with a hope to learn how to make brioche and kugelhopf like a professional French baker. Or rather like a French banker, given the steep price of the lesson. 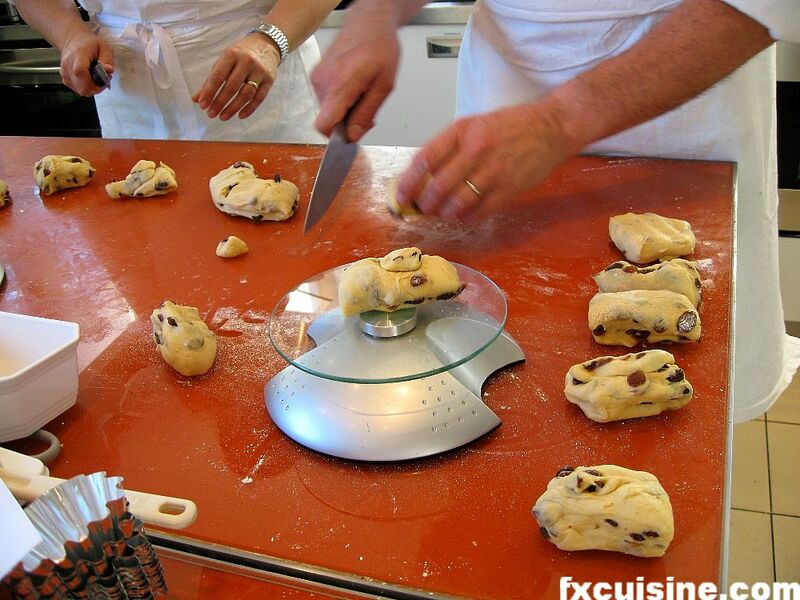 At €115 a lesson, these are among the most expensive pastry classes anywhere in Paris. But this is not just anywhere. After all, Lenôtre, official caterer to Paris' rich and famous, also runs a professional pastry school and cookery classes for home chefs. 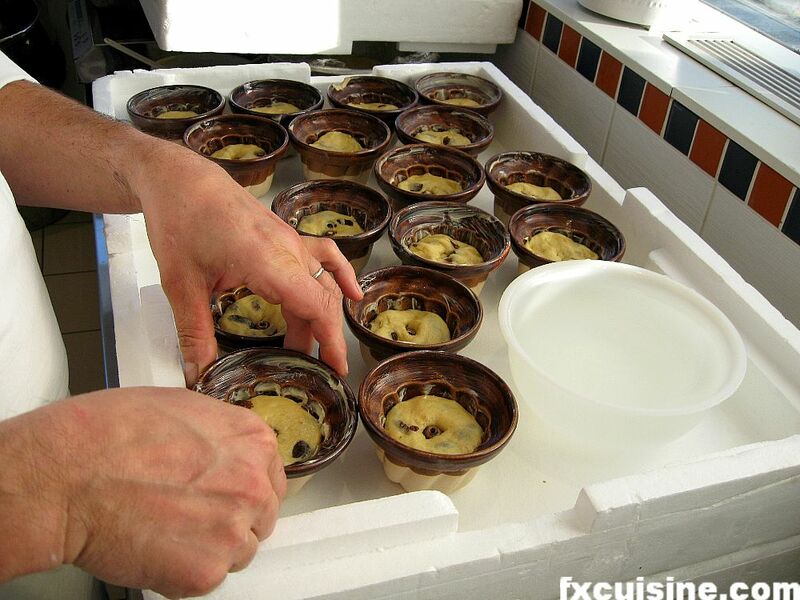 Classes explore a large variety of culinary topics such as Puff Pastry, Truffles, Morels, Foie Gras, etc... Each class lasts 3.5 hours with 6-8 students and a French chef. You can bring back home what you cooked. The best selling course is Macarons, the notoriously difficult French pastry. 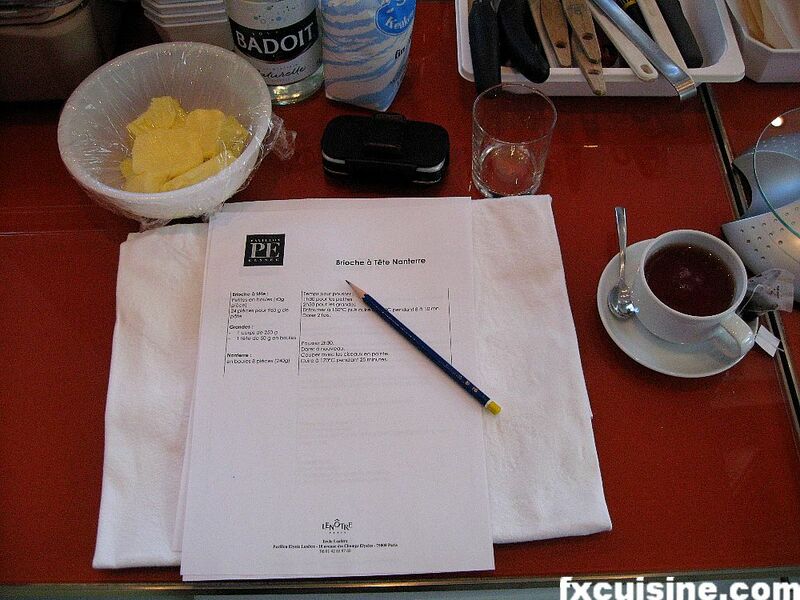 The most heavily booked course is Menu Bistrot, for advanced students who learn to cook an entire meal like a pro. 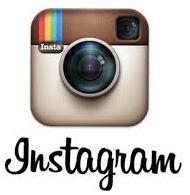 The students are mostly affluent Parisians and some French-speaking tourists. 80% are women. The choice of Lenôtre over Ducasse and Ritz-Escoffier was easy. 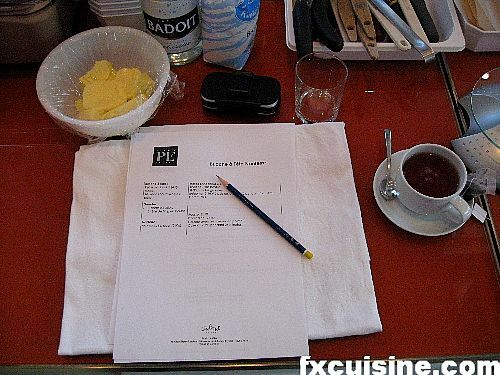 Lenôtre is the only one offering really advanced non professional classes, whereas the others look more like occupation program for upper-class Parisian housewifes than real pastry classes. I don't need to have dinner with the other students or a glass of Champagne at the end of the day. As I walked into Lenôtre's beautiful Pavillon next to the French Presidential palace on the des Champs-Elysées, a large boulevard modestly known to the locals as 'the world's most beautiful avenue', my sense of expectations began to rise. How good would the class be? What would the other students be like? Would we be playing chef with watered-down recipes for amateurs, or would they give us the real thing? 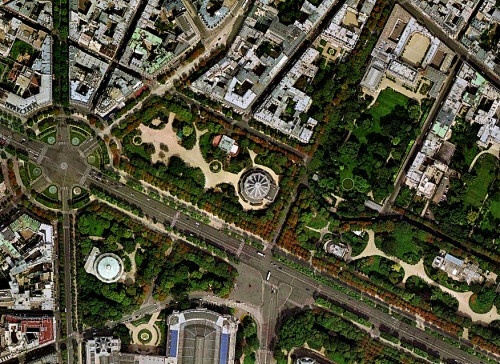 Lenotre's Pavillon is the building right of the white disk in the middle of the satellite picture, with the French Presidential Palace and its garden just above on the picture. The professor, François Schmitt, was a professional French pastry chef from Lorraine. Very serious and knowledgeable, he doesn't waste time in chit-chat and swiftly got down to the business of the day. We all sat around the table - the 5 women and myself. 'We received a call from Mr Da Silva, his plane just arrived at Orly from Brazil. He won't be joining us today.' the lady told us before she shut the door. A French-speaking Brazilian pastry enthusiast - that sounded interesting. One of the advantages of a live pastry lesson is to learn the tours de main, these culinary sleight-of-hands which books can't teach. I think there is much mythology behind this, as there is no magic in what pastry chefs do. It's mostly following good recipes to the letter using good products and professional equipment. In my Lenôtre class, apart from the mundane fraiser, spreading flour on the work surface, the chef showed us a very arcane circular palm gesture that turns any bit of brioche dough into a smooth ball. Quite literally, a tour de main (a 'hand circle')! The kougloff dough is ready to rise. To get consistent results, rising time is defined for a given dough temperature and you need to control humidity and temperature where the dough rises. At Lenôtre they use a styrofoam box as a substitute for the professional baker's étuve, and put a bucket of hot water next to the dough. 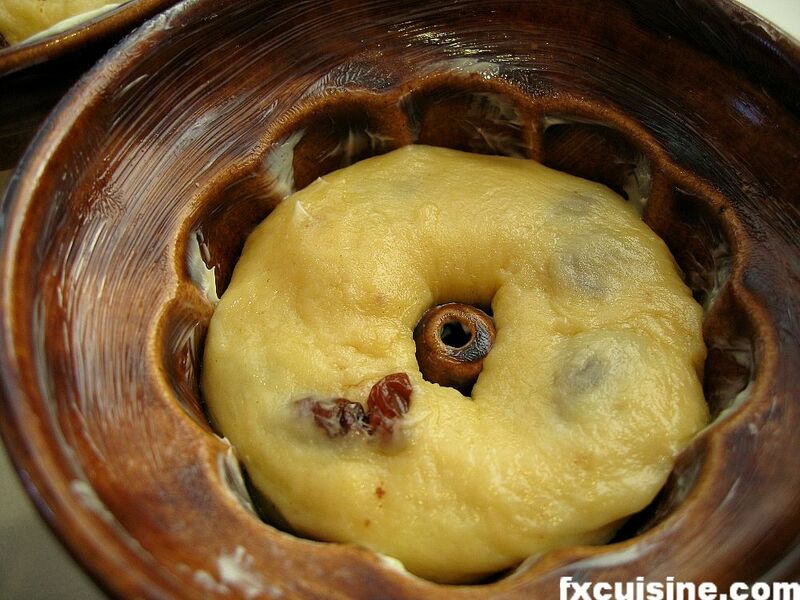 The bucket is replaced two times as the dough expands. The risen kougelhopf dough is cut down in pieces weighing each exactly 40 grams. 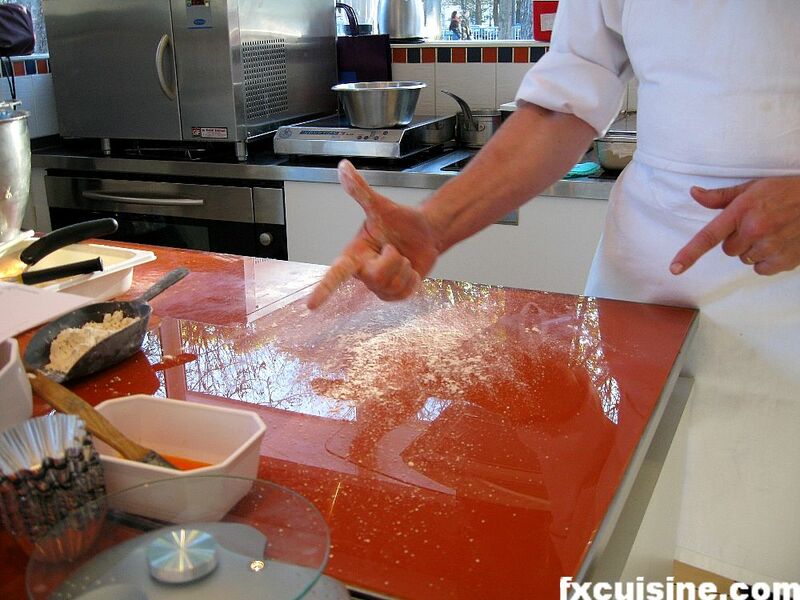 French cuisine is like this - extreme precision in quantities and time. 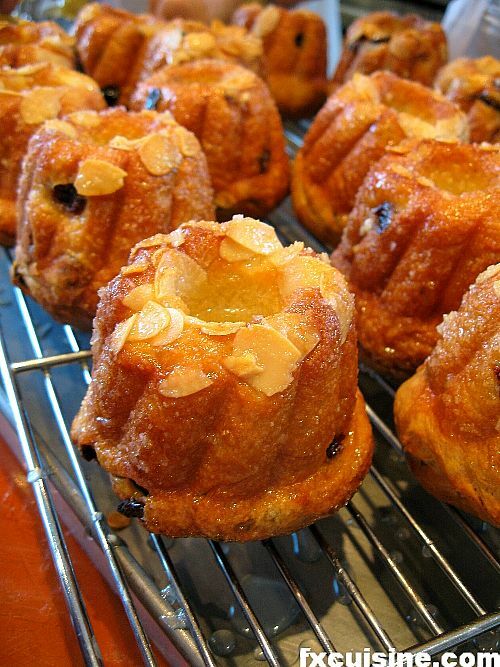 And when it comes to pastry, there is no question that they are right. 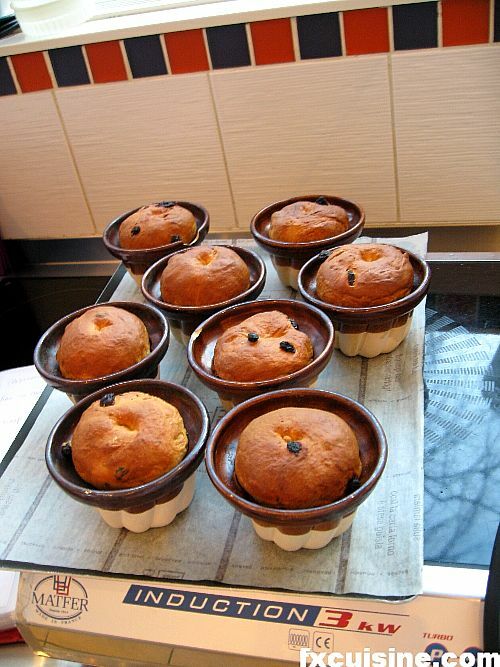 The kougelhopf dough is put in small clay kougelhopf forms. Professional bakers swear these forms give the best results. 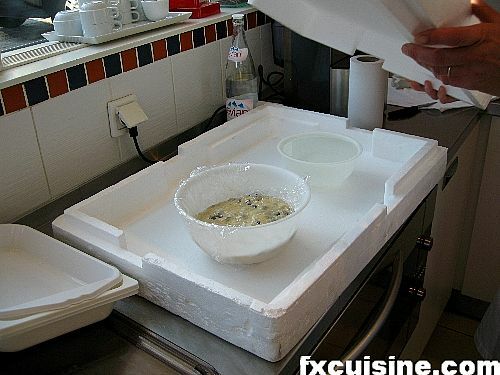 The filled forms are put in the closed styrofoam étuve for a further 30 minutes. 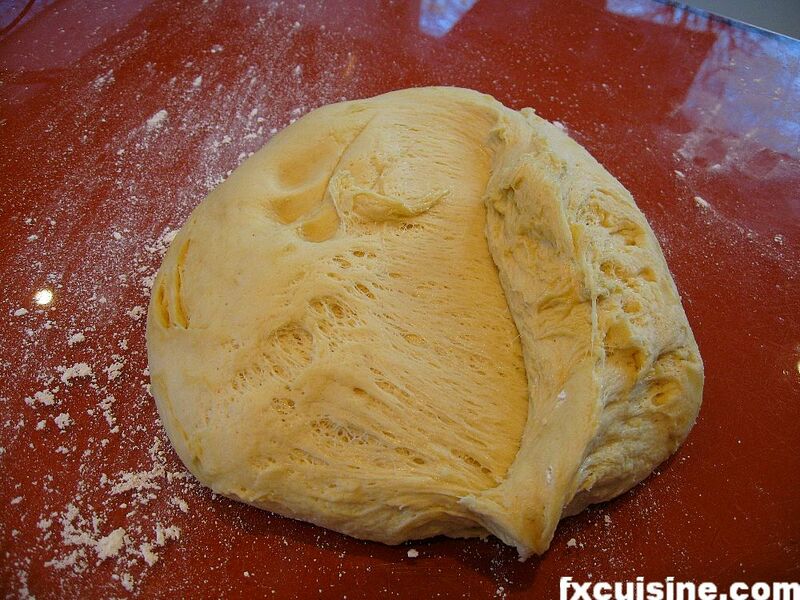 After the second rising, called pointage, the dough fills nicely the buttered forms. 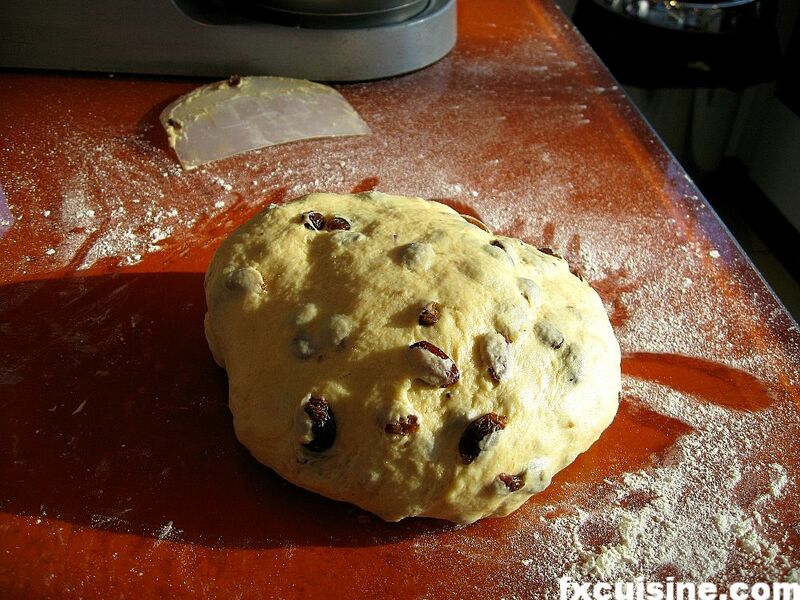 Bake in the oven. The kougelhopf fresh out the oven. While we wait for them to be cool enough to handle, we prepare the finishing touch. The first time I ate kougloffs, in Strasbourg, I was very surprised they weren't dry. They look dry but are moist inside. Here is how it's done. 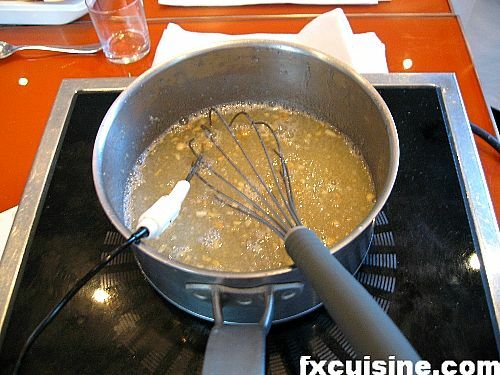 First you prepare an almond syrup flavored with orange water and bitter almond extract. On the picture above you see the boiling syrup with a temperature probe. Each kougloff is dipped in the syrup. This gives them incredible juiciness. 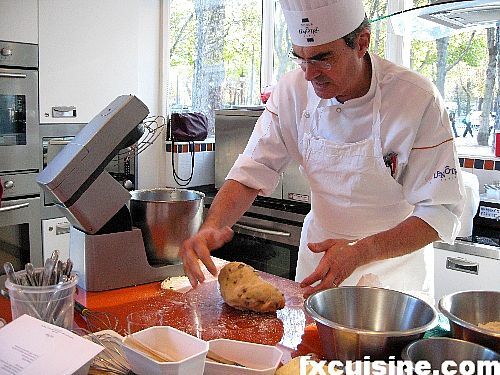 Some people, like Alsatian pastry diva Pierre Hermé, cover it with melted butter and add a bit of granulated sugar on top. Here, we didn't. Here is the end product, kougloffs ready to eat. Just as good as professionally-made ones.